This lesson is for students who want to practice listening skills, so there is no subtitle. I will make another video separately with subtitle and explanation for the useful phrases. Mod: Há? lŏng taang lâw? Mod: à-rai ná? mâi mii săn-yaan. Toe-rá-sàp chán..Ahh! suai láew! Bàet toe-rá-sàp mòt! suai láew! อะไรนะ ไม่มีสัญญาณ โทรศัพท์ชั้น…อ๊ายย ซวยแล้ว แบตโทรศัพท์หมด ซวยแล้ว! Mai: túk-kun, suai láew! náam-man glâi jà mòt. Tăew-níi mâi mii bpám náam-man. Mod: Há? à-rai ná? náam-man glâi jà mòt. suai láew! Mai&Mink : Mod, long bpai kĕn rót! You guys are cool ..
Great video, Mod! I very much appreciate that you and your co-stars were speaking at a faster and more authentic pace. There are plenty of other videos on youtube (both by yourself and others) where the words are spoken slowly. For intermediate learners like myself, videos like this are much more useful. One question: In the beginning of the video, when you say อยากไปกินหนมอ่ะ, I noticed you pronounced the particle อ่ะ as a falling tone even though the tone mark indicates a low tone. Can you comment on this? Agree with Simon’s comment. I have the same problem with people in the back of my car thinking that somehow they are safe. It is just a simple thing but can save you from injury. Nice video though. Thank you for your comment. 🙂 I always wear seatbelt when I am in the car. In this video I took my seatbelt off for a minute to be in the frame of the camera. Not easy, but very helpful. I only got about half of the conversation. I think it is a very good idea to make these kind of videos, without an explanation first, so that we are not tempted to read the translation, before we’ve tried to listen to what is being said first. Trying to catch what is being said in a normal conversation is still one of the most difficult things I find. I would be happy if you would make some more videos of this type. Thanks a lot. Hi Mod; thank you for a very entertaining lesson. I was interested in the word you used for snack – หนม (อยากไปกินหนมอ่ะ ). Isn’t หนม the word for the drug MDMA or ecstasy? Sawatdii ka Bruce, thank you for watching my video. 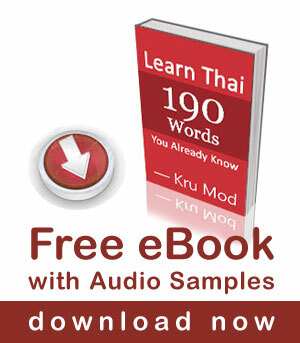 As for MDMA or ecstasy, in Thai is ยาอี /yaa E/ but I don’t know if they have other nicknames for it. Where’s your seat belt Mod? Too many people are being killed on Thai roads especially at Songkran! Buckle up please! Sawatdii ka Simon, thank you for you comment. I always wear seatbelt when I am in the car. This video is done for the purpose of learning Thai so I took off my seatbelt for a minute to be in the frame of the camera. Phuut chaa chaa noy daay may? pom may khoy khaw cay. สวัสดีค่ะมาร์ติน 🙂 Thank you for your kind comments and I am happy to hear that you found my lessons useful in your Thai learning. I had to listen to this video several times, and learn a few new words (stop by, signal, in trouble, push), but then I was able to understand most of it. You may want to explain that the word suai (in trouble) is similar to the word for beautiful, just a different tone.